Trailer in a Bag - "Owner has Died", and all Of the "Original" Business is Closed. * All Original Items are No Longer Available! Free Traffic Light Trigger with trailer order! * Design, Available Now, by New Owner! One man loading of your motorcycle. Walk the bike up, and the Condar wheel chock grabs and holds the front wheel. New Lower Design allows you to easily push up your motorcycle without running boards. • The Trailer in a Bag’s design allows one person to simply assemble and attach it to the tow vehicle. • The trailer assembles to its fully extended length. • Fenders and Condor Wheel Chock are standard equipment. 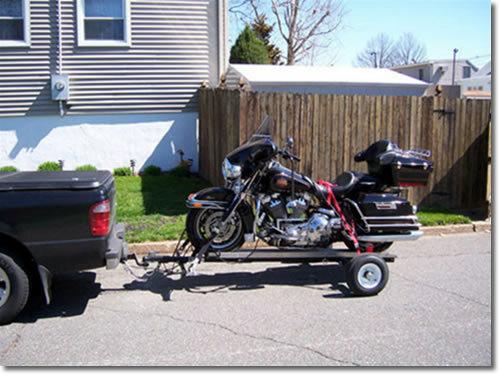 • One rider can safely load a motorcycle and secure the tie-downs. • The pneumatic characteristics of the tires and the suspension of the motorcycle itself provide for a safe smooth ride. • 2000 lb axle with Sure-Lube®. • Rated for 70 mph extended freeway use. A TRAILER THAT PEOPLE LOVE. Shipping available to most areas, remote areas may have an extra charge, call for a quote! lift the hitch assembly and tongue with a single motion. • The trailer unfolds to fully extended length. • Six pins insert and secure the hinged portions of the trailer. • Fenders and Wheel Stop are standard equipment. • One rider can safely load a Spyder and secure the tie-downs. • The pneumatic characteristics of the 13″ Radial tires and the suspension of the Spyder itself provide for a safe smooth ride. • Weight Capacity: 1771 lbs. All images and text cannot be copied.